No matter how big our homes are, they never quite seem big enough! If you’ve got a small living room and you wish it were bigger, we feel your pain. We’ve been there, done that, and today we’re sharing some lovely tips for you to help you make it look more spacious. Try some of these clever tips and it’ll be unrecognisable before long. If your goal is to make your space look bigger, you’ll want to avoid heavy fabrics. Whilst these work in spacious rooms, thick curtains will absorb light and weigh the room down, making it appear smaller. Choose light-weight material around your living room, such as light linen curtains to help it feel the room feel airy. If you’re daring, consider having a striped floor. This will make your room look longer than it really is – magic! Go for black and white for a really striking effect. We all know that white makes everything look bigger, but if you can’t face p to such a cold, blank canvas, opt for light, soft colours. Replace dark blues and greys with light greens and blues to brighten up your living room and make it instantly feel more spacious. It’s tempting to stuff your shelves with everything from books to last month’s shopping bags, but you should avoid filling up your living room shelves. Leave some empty spaces to show the true depth of the room and create airy look. If you have lots of books you need to house, pick floor-to-ceiling bookcases as this will make your ceilings look higher. Another clever method of making the most of your space is choosing the same colour for your curtains as you have your walls. This way, the curtains will blend into the walls rather than intruding on the space available and making your living room look smaller. Struggling to find the motivation to clean your windows? Bear in mind that they won’t just look cleaner, they’ll make the whole room look more spacious too. Dirty windows can distract the eye and prevent light from coming in. Make sure the glass is clean, inside and out. For a cheap option, fill a spray bottle with white vinegar, and dry using an old newspaper. When it comes to your furniture, soft furnishings, fittings, ornaments, curtains and carpets – pick different shades, tints and tones of a single hue. Multi-colours might make the room look exciting, but they’ll overwhelm a small space and ultimately, make it look smaller. Monochromatic colours are easy on the eyes, so you’ll be able to take in the whole room without being interrupted by contrasting colours. Have a clear floor as much as possible by choosing sofas and TV stands with legs. Your room will feel instantly more open as light will be able to flow underneath. Glass coffee tables are also a great idea as the light will be filtered through to the floor. The first thing you should do when making any space look bigger is have a good clear out. Decluttering your living room will make instantly make it look roomier. Plus, you’ll have less to clean and less to worry about. TOP TIP: A clutter basket is an easy way to do quick tidy ups every day and keep mess under control. If you’re up for redecorating your living room, the best thing you can do to make it look more spacious is get painting. If your floor is dark then paint your ceiling in a light shade. This will give the illusion of space as your eye will be drawn upwards. If you have the room, pull your sofa away from the wall slightly. It will create breathing room and make the space seem larger from the shadows created behind it. If possible, the largest and tallest pieces of furniture such as bookcases and tall floor standing lights should be placed in the corners of your room – this way your eye will find them easier to take in. The same goes for paintings – hang them near to the corners of the room to draw the eye to the widest points of your space. Most people know that a mirror will make any space look larger, however, there are different ways to implement this strategy in your living room. A large mirror is the best option for most homes, but they tend to be expensive. If you’re on a budget, try grouping smaller mirrors together on a wall and paint the frames in the same colour to create uniformity. If you have a skinny mirror in your bedroom, try turning it on its side and hang it in your living room. Choose a point the longest view away from the door and put an accent piece in it. Whether it’s an unusual ornament or an interesting plant, your eye will be drawn to it and this will make your living room appear larger. If you’ve got a small living room then one of the problems is storage. In order to make your living room look bigger, you want to keep as much floor and wall space on view as possible. The answer? Pick out dual-use furniture, such as an ottoman you can use as a storage space, seating and a table. Save floor and surface space by choosing a wall-mounted lamp, rather than floor or tables-standing. You could also try mounted shelves instead of bookcases to give yourself more room underneath to utilise as storage space. When you get a rug right, it can really enhance your space, but done wrong, it will look smaller than ever. When rug shopping, choose a pattern with small repeats to encourage the eye to follow the pattern and make your living room look bigger. Create the appearance of having a larger living room by using different rugs underneath different pieces, such as a rug under your coffee table and another rug underneath an armchair. Our eyes are drawn towards the light – overhead lights will draw the eyes to the ceiling, whilst a corner standing lamp will emphasise the size of the room. Arrange different lighting options round the room, such as lamps on the wall, candles and tiny table lamps. If your living room also acts as a dining room, be cautious when picking your table. Ideally, you want something that gives you the most space to use whilst taking up the least. One with removable leaves, or drop leaves will give you the best of both worlds. 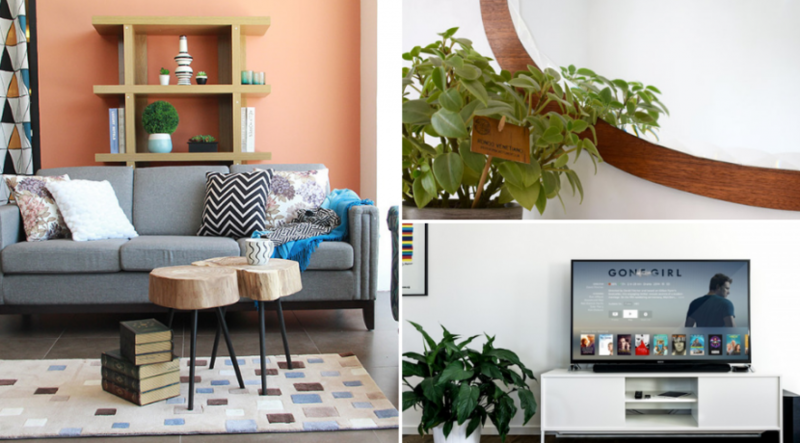 If you’ve got a small living room, then consider mounting your television. This way you’ll be able to free up floor space – a floating shelf placed just underneath is a great option for any television boxes or DVD players that need to be close by. Just because your windows aren’t tall, it doesn’t mean your curtains have to be. Mount the curtains near to the ceiling and have extra-long drapes. This will make the ceiling look higher, and the space appear bigger. Fancy going open plan without the comittment of knocking walls down? While this may seem drastic, removing the door to your living room will allow you more wall space to store items or hang photos. If you need to, hang a curtain across, which you can pull closed when needed. When choosing furniture, think about going retro. Vintage inspired appliances and furniture are often smaller in size and elevated on high legs, so will give you more floor space to work with.